I think it is shocking that in 2017 a club the size of Manchester United does not have a women's team, and what is even worse is they will not properly explain their position. Look around the world and every other major football club has a women's team, or plans for one. Two of the biggest, men's Champions League finalists Real Madrid and Juventus, are about to set up theirs. Most of those teams are fully integrated with the rest of the club and being backed financially too - a few miles from Old Trafford, for example, Manchester City's commitment to their women's side is clear. Southampton are the only other Premier League side not to have an affiliated women's team, although they have just announced a new under-21 team for next season, giving a pathway for the young female players in their girls' sides - something United's girls do not have. Locally, nationally or globally, whichever clubs United compare themselves to, they are allowing themselves to be left behind. When people have talked about this issue in the past, they have focused on how, with the club's vast resources and worldwide profile, a United team would help develop the women's game. That is still true, but it now works the other way too - United are missing out on an easy way of engaging with their huge female fanbase, in Manchester and further afield, and promoting the importance of women in the make-up of their club. A women's team would do all of that. The game is growing fast and other clubs have demonstrated they believe it is a big commercial asset, at very little cost. Why do United think differently? It's 'under review' - will the situation change? Women's Sport's Week: Why has this 16-year-old left Man Utd for Liverpool? When the BBC asked United last week about the prospect of them forming a women's team, the club responded by saying: "It is a matter that is under review and a detailed analysis is currently being undertaken." Taken in isolation, that reply gives the impression it is an issue being actively discussed by the club. The problem for me with just accepting that is the case and leaving them to get on with it is that United have been saying the same thing for several years now, since 2013. Whoever asks them about a women's team - and many people from United fans to MPs and national newspapers have done so down the years - United's stock reply is the matter is "under review". Hearing it repeated again and again makes it feel like a brush-off. The BBC's request for an interview was turned down but, if I was given the chance to ask United any questions, I would like to know who is actually carrying out this review and analysis. Who have they been talking to since 2013, what have they found out so far, is there any evidence a review has been happening - and, crucially, when is it likely to end? Why don't United have a women's team? United did have a women's team until the Glazers scrapped it in 2005, with a spokesman saying "it was not part of their core business". I can actually understand why they may have made that decision at the time - United were outside the top two divisions of the old Women's Premier League and the Glazers might not have considered them a good representative of their brand. Also, the profile of the women's game in the UK was a lot smaller then. But that was 12 years ago and things are very different now - from the level of professionalism at the top level of the women's game here to the way it is marketed and the commercial opportunities that come with that. So, if United's decision-makers are purely concerned with financial matters and still basing their views on women's football on what was happening when they ditched their women's team, they are well out of touch. I also wonder if the demographic of United's board has anything to do with the club's current stance. Of the 13 members listed on the United website, their average age is almost 50 and only one is female - Darcie Glazer Kassewitz, who is rarely seen at Old Trafford. United are not the only Premier League club whose board is predominantly male and middle-aged, but maybe their thinking boils down to the fact there is nobody in a position of power at United who believes women's football is important enough to be a proper part of the club. If they think that, why not just say it? Then there is the question of whether they are also scared of failing on the pitch. It is only four years since Manchester City obtained a Women's Super League licence. Since then, their investment in their women's team and its integration with the men's facilities and resources, has proved a great success. They won the domestic treble last season, and reached the semi-finals of the Champions League. City's men's team have finished above United in each of the past four Premier League seasons - could United be frightened that, if they had a women's team, it would be overshadowed by City too? At the moment, United do have girls' teams, up to the under-16 age group. Those sides have been very successful, something that is rightly trumpeted by United but, unlike the boys' sides, they are run by the Manchester United Foundation as a Regional Talent Club, not the club itself. That's an important difference - the girls' teams wear United shirts but they use separate facilities and rely on separate funding and grants, only some of which comes from the club. When I talk to parents of girls who play for those teams, some of them say they don't feel a full part of the United family. I can understand why. Before the Women's Super League was set up in 2014, some clubs tried running their women's team through their community arm and, with that set-up, it almost feels like they are associated with the club but being kept at arm's length. Thankfully, things have moved on and girls' and women's teams are now far more integrated at most other Premier League clubs including Spring Series winners Chelsea, whose girls' teams are also run as a Regional Talent Club but are based at the club's main Cobham training ground. United's girls train in Eccles, nine miles away from the club's Aon Training Complex in Carrington, which is where the United boys' teams play. Whoever United are talking to as part of their ongoing review about a women's team, it does not appear to be anyone at the United Foundation involved in their girls' teams. When I've spoken to people who work there, it is almost a taboo subject. Nobody wants to go on the record to say they think the club needs a women's team, even if privately they are frustrated and think it is long overdue. As well as the fact United are missing out financially by not having a women's team, there is a human cost too. The talented local girls, who United are developing as they come through their ranks in their teams from under-8s upwards, have nowhere to go past the age of 16. They have the same dream as the likes of United striker Marcus Rashford - to play professionally for their local team, who they grew up playing for and supporting. Women's football is a career now but, unlike Rashford, girls cannot pursue it at United. England Under-17 goalkeeper Emily Ramsey is a United fan from Salford and had played for them since the age of eight. But, now she is 16, she had to leave this summer because she did not have a team to play for, and joined Liverpool instead. I spoke to Emily and her mum, Kate, as part of Women's Sport Week, and Kate explained the different opportunities available to her daughter at Liverpool. United are one of the top regional talent centres for girls and Emily grew up there, and had some amazing experiences. But she has gone from being the oldest and best keeper there to being part of a much bigger - and fully professional - set-up at Liverpool, where she can train and learn from England goalkeeper Siobhan Chamberlain. Emily is in a great position now and clearly enjoying her football with Liverpool but it must have been very hard for her to leave United. For someone in her position, it must seem like the club you love does not love you. Not every girl who plays for United is as lucky as Emily. Most of her former team-mates are going through a succession of trials to try to find a new club, at the same time as sitting their GCSEs. If they get an offer - and they will not find out for several weeks and after several trials - they might not be able to accept it because of logistical issues - transport, travel time, expense - the sort of thing that did not affect them at United. It is hard enough to make it as a professional anyway and the reality is that some of them will stop playing at a high level, and not because of a lack of ability. Every year, the same problem occurs and, whether United like it or not, their lack of clarity over settling the issue is affecting younger girls too. As her mum explained, when Emily joined United to play for their under-9 team, they knew there wasn't a women's team then but they were hoping there would be by the time she was old enough. United stalling over whether they will set one up has probably influenced a few other players about whether to play for their girls' teams or not. They are also hoping that the situation will change. That's not fair, if there are better opportunities out there. Women's football is a career now - not a hobby - and United need to give their talented young players a route that lets them keep progressing, rather than stunting their career opportunities. Nobody can force United to set up a women's team - not at the moment anyway. But it would be different if it was stipulated that having a women's team was one of the requirements for clubs to get a licence to be a member of the men's Premier League. That seems a fair suggestion to me, and would fit in with the Premier League's own commitment to equality. The funding that Premier League teams would need to run a women's team would surely not be a problem, with the mind-boggling sums that clubs get just by being in the men's top flight in this country. I don't think United would struggle to attract sponsors for a new women's team, although the club's principal partners, Aon and Chevrolet, their kit supplier Adidas and feature film partner 20th Century Fox did not respond when asked about the issue by the BBC. Something has to change, though. At the moment, while boys like Rashford can grow up supporting United and dreaming of playing for the club, girls cannot. For all the positive work that United do in their local community, there is nothing inclusive or equal about that. 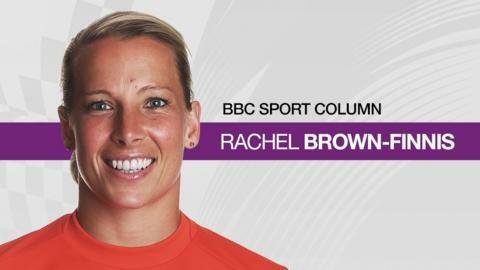 Rachel Brown-Finnis was speaking to BBC Sport's Chris Bevan.